The Birth Card is about creativity and we have to start with the miracle birth of a child. The birth of a child shows ripples in the family, the community and the whole universe. It changes something; it displaces what was there before. 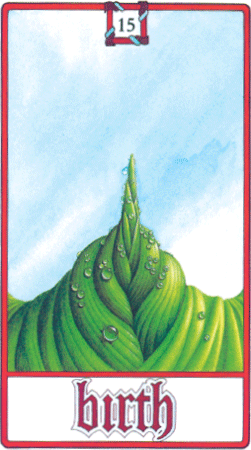 This card also tells us that around us things are in gestation and have acquired a momentum of their own. You can play with an idea or make some plans and still be in control, but once the birth process sets root, it grows like an embryo of its own accord.